Free printable coloring page of some beautiful flowers. Flowers color your day and make people feel happy. And because of their varied and colorful appearance, flowers have long been a favorite subject of visual artists. Some of the most celebrated paintings from well-known painters are of flowers, such as Van Gogh’s sunflowers series or Monet’s water lilies. Some rights reserved (Creative Commons). This coloring page is created by Frank De Kleine. Original photo Moyan Brenn. 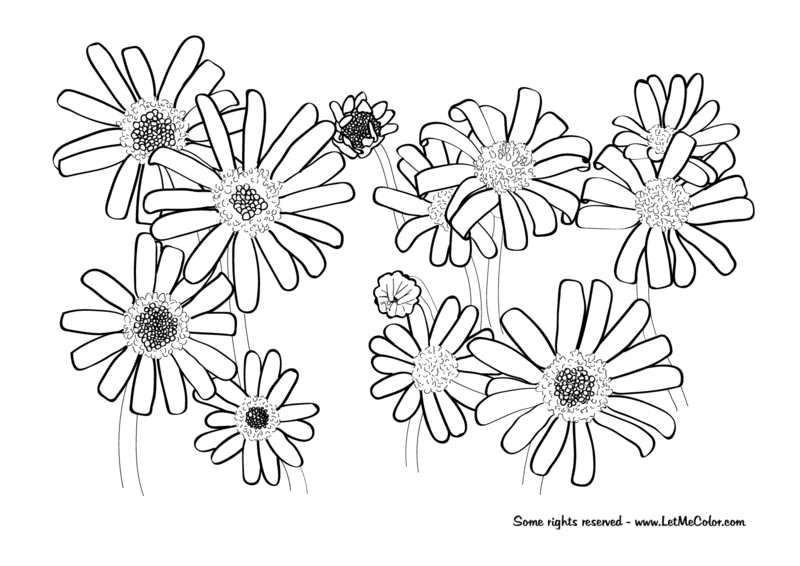 Free & printable coloring page of some very beautiful floating flowers. On the original photo you can see that these flowers are actually pink or purple. But of course you can give them any colour you like. You even can give each flower another colour. Have fun! Some rights reserved (Creative Commons). This coloring page is created by Frank De Kleine. Original photo by Jenny Downing. Free printable coloring picture of the Calla lily (Zantedeschia aethiopica), after a rain shower. This flower is also known as Lily of the Nile and Arum lily. Some rights reserved (Creative Commons). This coloring page is created by Frank De Kleine. Original photo by Bill and Mavis T.
Free printable coloring page of two water lilies. Some rights reserved (Creative Commons). This coloring page is created by Frank De Kleine. Original photo by babasteve. Free printable coloring picture of some beautiful cosmos flowers. Some rights reserved (Creative Commons). This coloring page is created by Frank De Kleine. Original photo by skyseeker. Free printable flower coloring page of a rose. Perfect valentine gift! Some rights reserved (Creative Commons). This coloring page is created by Frank De Kleine. Original photo by Fábio Pinheiro. Free printable sunflowers coloring page. Some rights reserved (Creative Commons). This coloring page is created by Frank De Kleine. Original photo by Kazuhiko Teramoto. Free printable coloring page of a Lotus flower. This is my second realistic flowers coloring page. It reminds me a bit of Vincent van Goghs’ Sunflowers, although I would not compare my work in any way to Van Goghs’. Some rights reserved (Creative Commons). This coloring page is created by Frank De Kleine. Original photo also by Frank De Kleine. Realistic coloring page of flowers for your mom? I think this is a really great realistic coloring page of some flowers. Do you need some pretty flowers right this minute? No time to go to the flowershop or order flowers online? Print out this coloring page, give it the colors of your choice and make someone happy! Some rights reserved (Creative Commons). This coloring page is created by Frank De Kleine. Original photo by Barbara Fox (aka Foxicat).